With a sweet downtown sliced by train tracks, San Juan Capistrano is a fun destination for kids who will delight in witnessing the crossing guard’s flashing lights and dinging bells all day long. This laid-back Southern California town is easily reached by car or train from San Diego, Los Angeles and beyond, making it a great choice for a weekend getaway. Here are some fun things to do in and near San Juan Capistrano with kids, as well as family-friendly restaurant and hotel recommendations. While my visits to a couple of other California missions felt ho-hum, I was a surprised by Mission San Juan Capistrano’s allure and peaceful effect. Known as “the jewel” of missions, the grounds are so beautiful that I had a hard time deciding what NOT to photograph. The koi fountain intrigued both my children as did the flitting butterflies, bees and hummingbirds. Come in spring to see the mission’s famed swallows, which return every March during their migration from South America. Hand-held audio controllers are included in your entrance fee. My preschooler enjoyed finding all of the numbered audio stations and listening to commentary about the mission’s history and role in the town and California’s history. Mission San Juan Capistrano is one of 21 present-day missions. 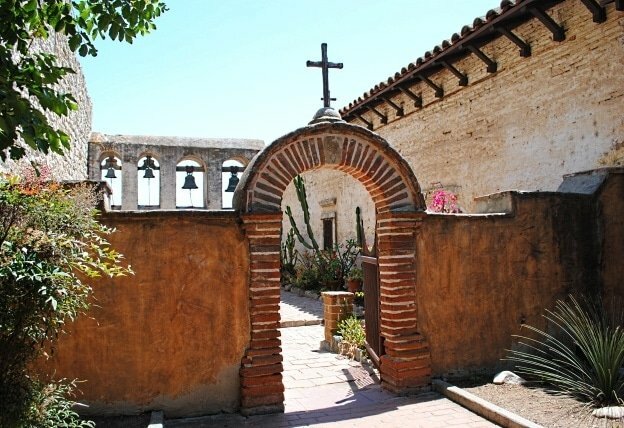 The Spanish missions were established between 1769 and 1833 as a way to spread the Catholic faith and colonize what is now Southern California. Across the tracks from the train station follow the signs to find Zoomars. Children can snuggle bunnies and guinea pigs, ride a miniature train, pan for fool’s gold, and ride ponies — all for various nominal fees. 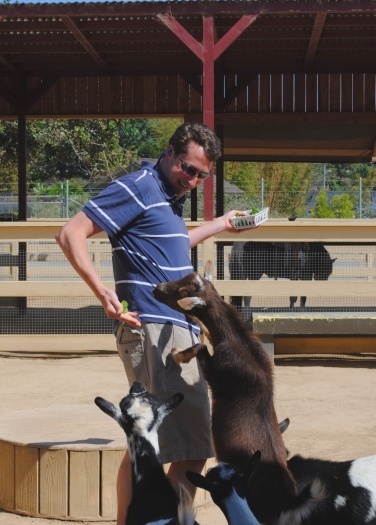 Visitors can also feed veggies to eager goats. But beware…they WILL jump on you! 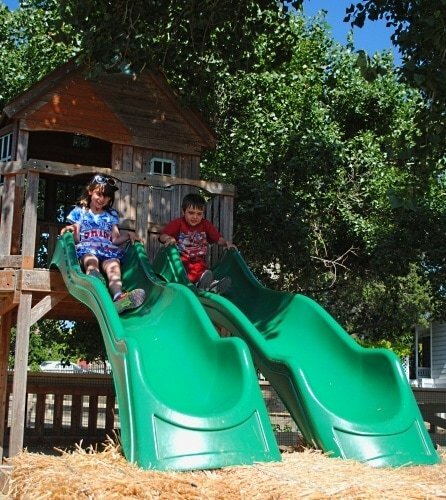 Sliding and climbing on the playground structure is included in the entrance fee. About three miles south of San Juan Capistrano, meander through shops and restaurants at Dana Point Harbor. You can also sign up for a whale watching tour, kayaking adventure or other water excursion here. Several friends recommended our family dine at the Harbor Grill. Oh boy, were we glad we did! Seafood is the specialty here and the kids’ menu offers the usual suspects. It’s not cheap, but if you’re hungry the prix fixe three-course meals make the bill more manageable. A ten-minute walk from Dana Point Harbor, Doheny State Beach is one of the loveliest California beaches I have ever visited. The waves are pretty bold, so watch children vigilantly. A wide expanse of sandy beach draws families galore. Plentiful grassy space with barbecues wafts the smell of smoky eats. Bring a kite to fly on a windy day or rent bicycles or a surrey from Wheel Fun Rentals. The snack bar was curiously closed on the day of our visit (a Saturday in June). Be sure to plan ahead and pack your own treats. Restrooms with changing areas are available. Conveniently located just a short block away from the San Juan Capistrano Depot train station is the charming and delicious Sundried Tomato American Bistro. 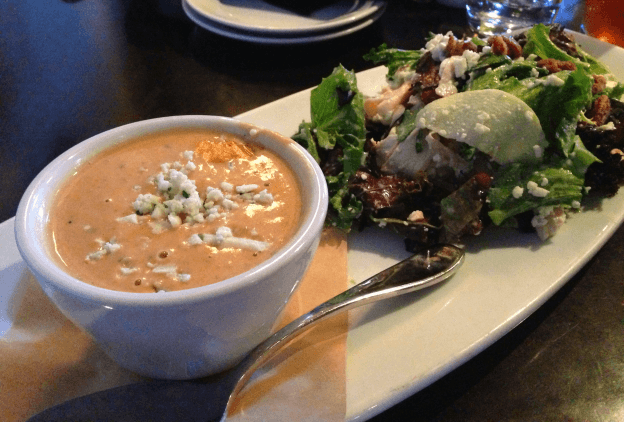 You absolutely MUST get a cup of their signature Sundried Tomato Soup, a creamy concoction topped with crumbled cheese. My husband, currently on a carb-free diet, said his noodle-free vegetable lasagna was the most delicious thing he’d eaten in weeks. The menu offers salads, burgers, pastas, larger entrees (chicken, steak, seafood) and kids’ dishes. Take note, however, that juice for kids is very expensive here. Therefore, you might want to stick to water or bring your own sippy cups. Built in 1793, El Adobe de Capistrano is the oldest restaurant in town. A few locals recommended this restaurant as THE place to soothe Mexican food cravings. You will find typical fare like enchiladas, tacos, burritos and some delicious salsa fresca here. Ruby’s Diner is where to go for dependable milk shakes, burgers, fries, and other diner fare. Any kid would love to grab some chow here. 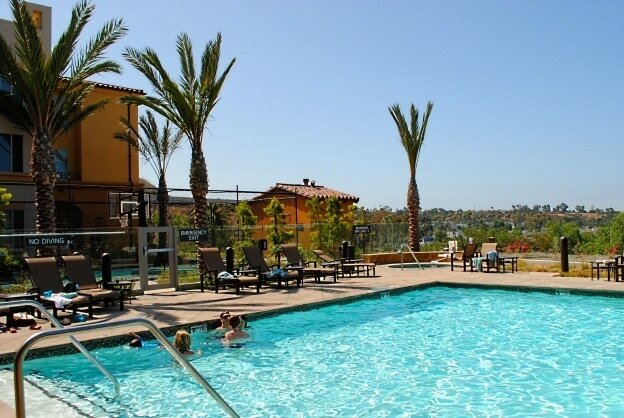 Residence Inn San Juan Capistrano offers plenty for families. Expect spacious suites with full kitchens. Active kids will appreciate a pleasant outdoor pool, a basketball court, and a putting green with clubs and balls to borrow. There are even barbecues if you want to grill out one night. Included breakfasts make mornings easy, affordable and fun. Want to stock up your fridge? Just give the front desk your grocery list and they’ll purchase the items for you and add the total to your bill. As an added bonus, Residence Inn San Juan Capistrano provides a free shuttle for guests anywhere within five miles of the hotel. This makes exploring the town without a car easy and convenient for families like ours who arrive via train. Read more about Residence Inn San Juan Capistrano and discover additional hotel options for families via TripAdvisor. Are you dreaming of a California family vacation? 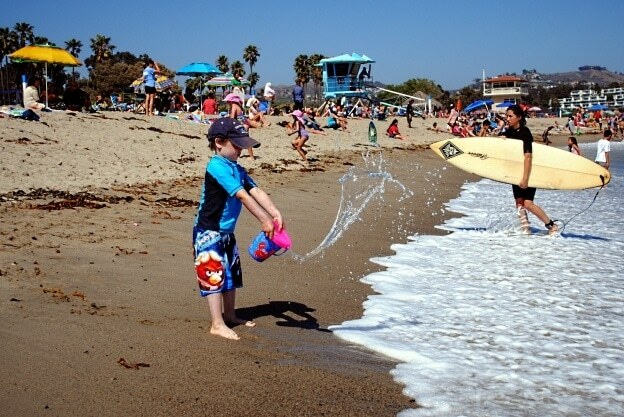 Check out our picks for the best destinations for kids in California now! 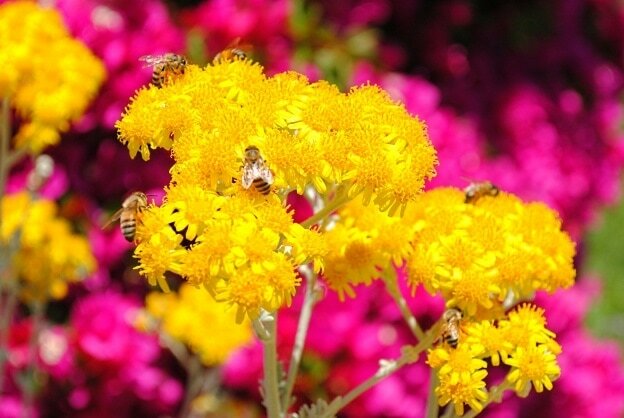 Do you have any recommendations or questions for exploring San Juan Capistrano or Dana Point? Let us know in the comments below! A Note from The Travel Mama: Residence Inn hosted my family during our weekend stay as part of a partnership with this brand. OH! I had no idea there was so much to do and explore there. Thanks for the tips! Jessie – San Juan Capistrano really is a sweet little town for a weekend getaway. Thanks for the comment! San Juan Capistrano has really, really changed since we visited there over 40 years ago. The most memorable part of our visit was a lovely winding trail which had all sorts of desert plants. What made it memorable was my husband picking up a prickly pear that wouldn’t let go. You mentioned there is so much more to see and do now that one doesn’t have time to wrestle with plant life. Ha! Yes, we steered clear from the cactus! This entire week-end outing, including the train ride from San Diego to the neat beaches and restaurants, is something I have now added to my bucket list. I would not have known how much this area has changed if it wasn’t for your article. What a fun idea! Can’t wait to hear all about your trip! Laurel – It really was such a peaceful, lovely place to visit with or without kids. Thanks for your comment! The flower and bees caught my attention too. 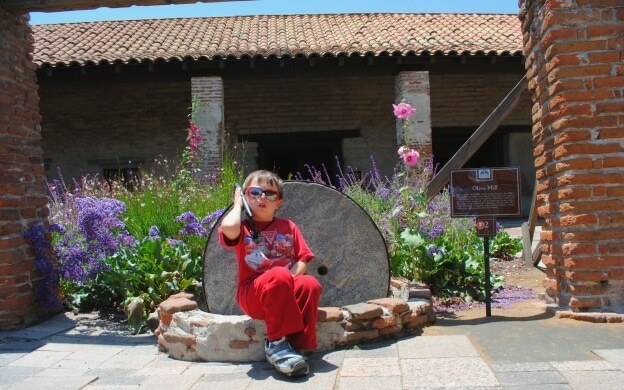 San Juan Capistrano looks like a delightful family getaway destination! Allison – There were so many photo opportunities here! It feels like it was built for a photographer. 😉 I am thinking of doing another photo-based post focusing just on Mission San Juan Capistrano—it was hard to narrow down which pictures to include with this story! Hi there Colleen! I stumbled upon this page while on a google quest for (I can’t even remember what I was looking for haha!). Well anyways I wanted to thank you for visiting this small little town I am so thankful to call home every day. I went to the Mission Parish School as a child and got to see the Mission more than once a year and got to take in the yearly St. Joseph’s Day and following Swallow’s Day Parade almost every year for about nine years! It was such an incredible experience for me and I’m so glad that you had so much fun enjoying this city of mine! If you even find yourself in San Juan Capistrano again there are some amazing little tiny “whole-in-the-wall” restaurants that are not necessarily kid friendly but have incredible meals, such as: the Humming Bird Cafe, Fianos, Ciao Pasta, El Maguey, and so many more! Also if you come during the summer (specifically on a Wednesday) there are free concerts on the third Wednesday from May-August where a cute farmers market sells everything from homemade humus to fresh fruits to gorgeous flowers! There are even events for kids at these summer concerts and I absolutely recommend them if your family does not mind sitting on blankets and bringing a pack of sandwiches and drinks for you to share! Also there are child productions of famous plays shown in the Los Rios Playhouse just between the park and the Mission! I hope you’ll find yourself in San Juan Capistrano sometime again soon, and I’m so grateful that you seem to love it just as much as I do! Meaghan – How wonderful that you live in (and appreciate) your beautiful home town! I hope to get back there someday. San Juan Capistrano would make a lovely spot for a romantic getaway and then my husband and I could try out those restaurants that you recommend! FYI your link to Sarduccis is for a restaurant in Vermont. Sarduccis is closed and now is Trevor’s at the tracks. My sister goes there all the time with 2 toddlers and sits on the patio. They love watching the trains go by. Hi Kristin – Thanks so much for the heads-up about Trevor’s at the Tracks! I’ve deleted the bit about Sarducci’s.